Scott Gunderman Performance Engines of Indianapolis built this Exotic Motor. 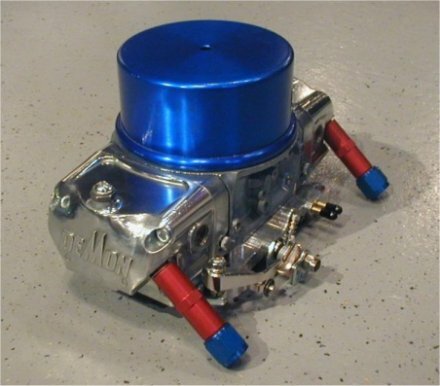 I have decided on 408 due to the severe rod ratio and shorter, clearancing, and lifespan of the 427 motor. These valvecovers were sold on Ebay. Engine Builder said that there wasn't enough meat on the mounting surface and would bend and leak on installation. I agreed. The block came out very nice. 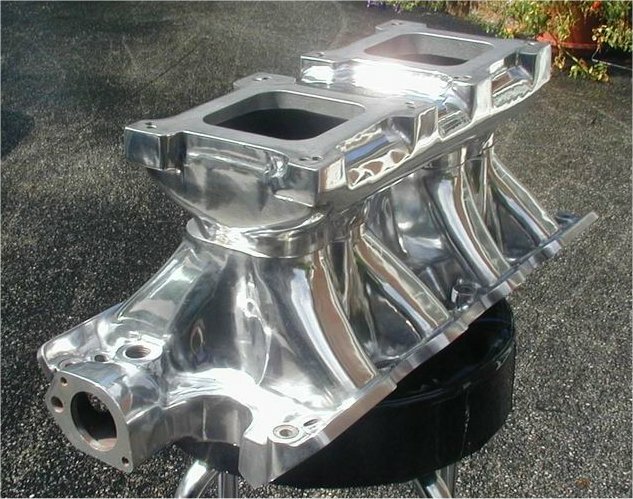 I used por 15 to fill pors on the stock casting of the block, then painted and clearcoated it. Now the Build begins! Heads have been milled .10 and Valve guides prepped. 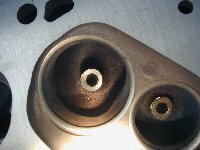 2.190 intake valve and 1.710 exhaust valve size has been determined, and ordered. I received my Offenhauser Tunnelram back from the polisher. Valves have arrived. 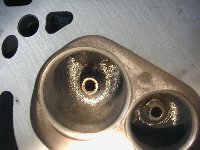 "Ferrea"Big Block Chevy intake Valves. Ford Exhaust valves. 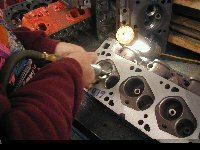 I also held up one of the valve covers to the intake just to get a peek...It's going to look Awesome! Heads have been Ported. They are not all hogged out, just the bumps on the ports were smoothed out for better flow. The Ramps on the inside of the chambers have been removed so air flow is not disrupted. Valve guide bosses have also been narrowed. This is a good before and after comparison. Here's the Blue Thunder Main support Girdle. Notice it is already notched for a stroker crank. Wiseco Racing Piston custom made for my application. It's almost like a work of art! Mock-up Engine was installed to find motor plate placement. (Minus adapter plates)I just had to set it all together. The master will have to be popped off to remove valve cover. Flexible hydraulic lines will make that possible without breeching the system. I'm very pleased with the out come thus far! It's very intimidating looking at it in person. I have sat and stared for long amounts of time..hehe. Looks like a big block sitting down in there. A pair of Mighty Demon 650 cfm Carburators will be feeding the Engine.